for,while loops and foreach ( x => f(x)) higher order function. The test is repeated 25 times in order to reduce variance and noise generated by the garbage collector. The first 5 iterations are discarded to avoid the overhead of the initialization of the JVM. 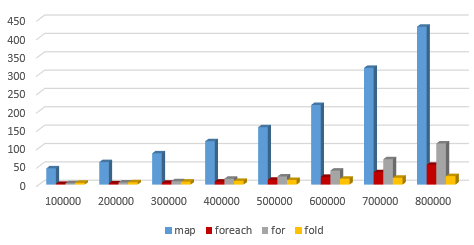 The mean value of the execution time for each method is computed for different size of an array from 2,000,000 to 40,000,000 floating point values (type Float). The results of the test are plotted in the graph below. The unit of time on the Y-coordinate is milliseconds. The for, while and foreach expression have very similar performance. Let's run the same test (with the same setup defined in the previous section). 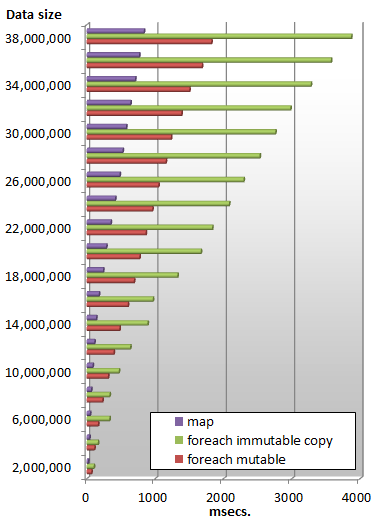 The test shows that the method dedicated to convert an array to other array by applying a natural transformation, map is by far the most efficient. Therefore, it should be avoided as an iterative counter and reserved to be used as for-comprehensive construct. 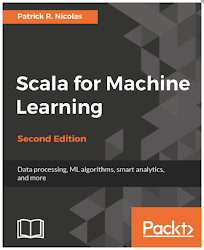 A more elaborate and time consuming benchmark would consist of running multiple tests using several boolean (< !=..) and numeric (+, *, x => sin(x) ..) operators and computes the normalize mean and variance. your "for-loop" is a very bad example, it is no normal C loop. 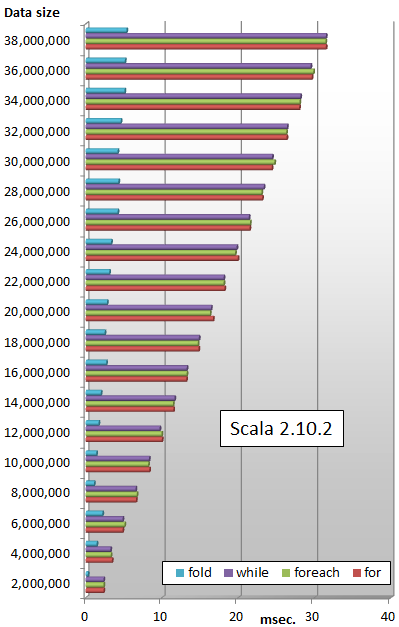 If you realy wanted to compare C loops against scala iterators you would have to use a while. I have no idea what this article is supposed to prove. First of all, running a test only 10 times is not enough to guarantee that JIT has warmed up. But I'm going to let it pass. It's an understandable mistake. In the first test, the foreach loop does absolutely nothing. data.foreach( x => x + z) == () and nothing is modified, map creates a copy of the array, and for modifies the array in place. And finally, in the second test, foreach again does nothing, map does something barely sensible (creates a new list in a very contrived way) and foldLeft... returns the last element of the list. Of course the results are gonna vary, each of the tested methods in both cases does absolutely different things. It's not even comparing apples to oranges, it's comparing Apple Inc. to oranges. I really baffles me that while performs so badly. How could .sum possibly be faster, except if it uses parallellism, which is shouldn't by default. By the way, did you compile the program using the scalac -optimize? You should have.